This has been the first year in which I have properly utilised the abundance that hangs on elder trees at this time of the year. Now is the time to go find elderberries as the birds are now munching on them. 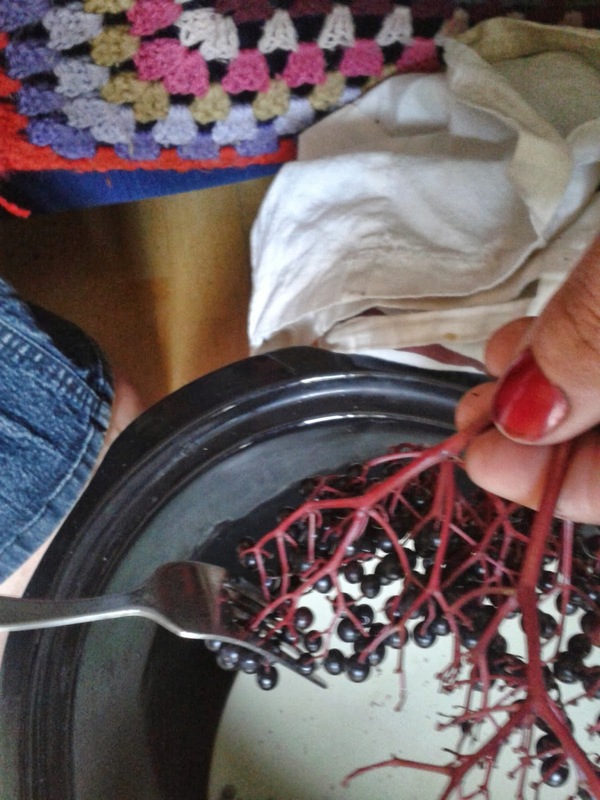 Elderberries are seemingly excellent for boosting the immune system, and are supposed to be good medicine for giving to sufferers of colds and flues. 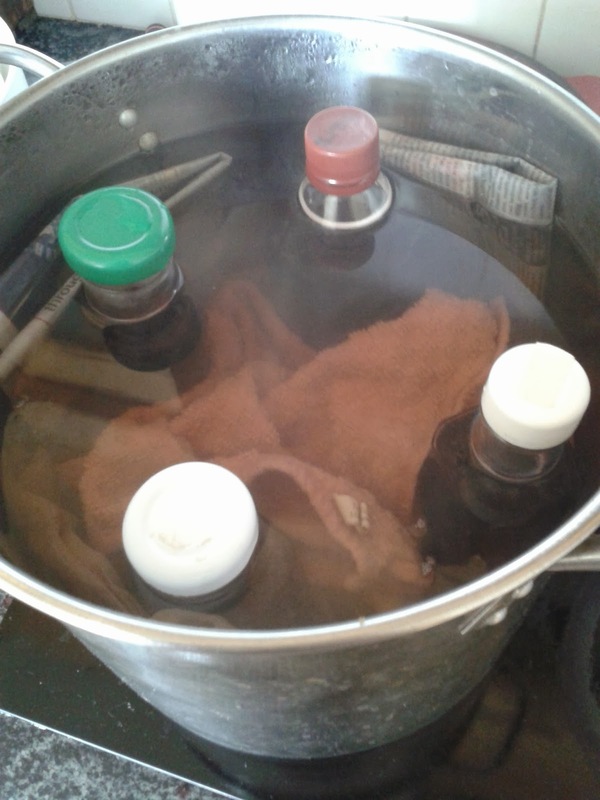 Here follows the recipe that I use for making the cordial. Use a masher to release as much juice as possible, and strain through a jellybag or nylon sieve to remove the pulp from the juice. Measure the juice, and to every 1L of juice, add 625g sugar (the juice is at this time cold, so using caster sugar will ensure that all of the sugar dissolves), mix this in and bottle it up into clean, scalded bottles. Old tomato-sauce bottles work well, also vinegar bottles. The next step is to can these bottles, this is done because there is not enough sugar in the solution to act as a natural preservative. Don't worry, canning is easy (when you have a thermometer). Into a deep pot (stock pot is ideal) put a folded up dish towel, place the bottles onto the tea towel and wedge more tea towels or newspaper around them so that they do not touch each other or the sides of the stock pot. Fill the pot with water so that water comes up to the level of the juice (it is useful to use bottles that are the same height), you do not want water getting in to the lid. Apply heat and allow the temperature to rise to 77 degrees C, you want to keep it at this temperature for 30 mins. If it goes much above 90 degrees, many of the health-giving properties of the elderberry may be lost. After 30 mins, remove them from the pot and ensure that their lids are firmly on. Congratulations, you have done some canning! 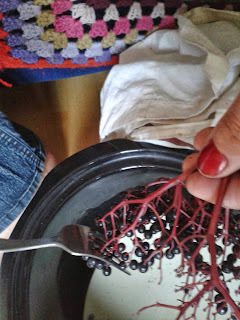 Remember the elderberry pulp that that is sitting in the jelly bag? Well that can be turned into jam- delicious jam. Some sources say to sieve the seeds out, but I don't think that seeds are a problem, sure isn't red current or gooseberry jam riddled with seeds? It is a good idea to use either jam sugar or a few apples to provide the pectin for this one. There are plenty of recipes for jam on the internet, so enough said.